Enjoy these Horseback Riding Tips based in a natural approach to keep you safe and having fun in the saddle. Donâ€™t ever be too proud to get off. Some accidents are unavoidable. The horse trips and you are thrown off balance enough to come off, or he departs a bit quicker into the canter than you were expecting him to. No one can predict when something like that is going to happen. Other times when you get thrown there were red warning flags out long before you got pitched. Itâ€™s in your gut, you know the feeling. The â€œuh-oh I am not so sure I want to keep riding this horse while it is doing that" feeling. 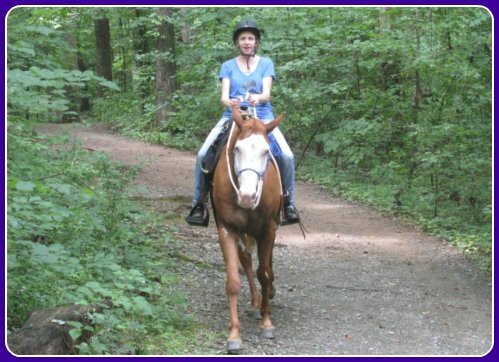 This is one of the best horseback riding tips that people ignore: Go with your instincts and get off the horse. Try and regroup on the ground and if that doesnâ€™t work, call it a day and start again another day. That way you will leave your confidence in tact, and possibly avoid escalating an already dangerous situation. The horse is not going to think heâ€™s â€œwon" because horses donâ€™t think like that. Horses run on instinct. If he was bucking there could be many reasons why. His saddle might be pinching, you may have changed tack and he doesnâ€™t like the feel of it. He could have a back problem. He didnâ€™t want to move forward when you asked and so started bucking instead. Especially if the behavior was unusual for that horse try and figure out what triggered it. Then and go back and fix it through quality ground training and/or a veterinary diagnosis first before returning to riding. For a moment put yourself in your horsesâ€™ hooves. Itâ€™s 100 degrees outside, youâ€™re hot, sweaty and itchy from a soaked saddle pad and heavy saddle and your rider is making you practice spins each direction 1000 times. If you donâ€™t, your rider insists not so kindly with his spurs and whip that you do it again. Doesnâ€™t sound like much fun does it? While riders should be natural leaders for their horses and direct and ask things of them, they shouldnâ€™t be drill sergeants or dictators. Horses learn 8 times faster than people do. They do learn by repetition, but also need variety. Keeping your horsesâ€™ feelings and limits in mind will make for a happier horse who will perform better each time for you. This is much better than one that eventually wonâ€™t come to the gate to greet you because heâ€™s tired of your â€œtraining." Contrary to popular riding belief you do not have to have a deep heels down posture to stay safe in the saddle. The reason instructors teach this is to keep your foot from sliding through and getting caught up in the stirrup which is dangerous. Having your heels way down is also believed to give you a firmer foundation. A firmer foundation should come from the way your behind sits in the saddle and how well you move with your horse, not how low your heel is. Balance and the ability to flow with your horse is much more important than having your heels down. An artificially deep heel, especially in a beginner rider, will cause tension in the ankle, knee, hips, and up to the lower back. Riders will often get pain in one of these areas from straining too much to keep the heels way down. It almost always causes you to brace through your lower back as well. Keeping the heels slightly lowered will keep your foundation strong, your foot from sliding through the stirrup but not cause you any additional problems with bracing, pain and stiffness. Our heads weight something like twenty pounds! Now that probably doesnâ€™t seem like too much in comparison to the rest of our bodies, but our horse should be following our focus whether that is over the next jump or somewhere down the trail. If you are looking nowhere (down) you are going to throw your balance too far forward, putting you at risk for falling forward should your horse stop suddenly. You could wind up on your horsesâ€™ neck! Keep your eyes and head up, and remember you should always look first to where you want to steer your horse. If you are looking nowhere, your horse should be going nowhere.